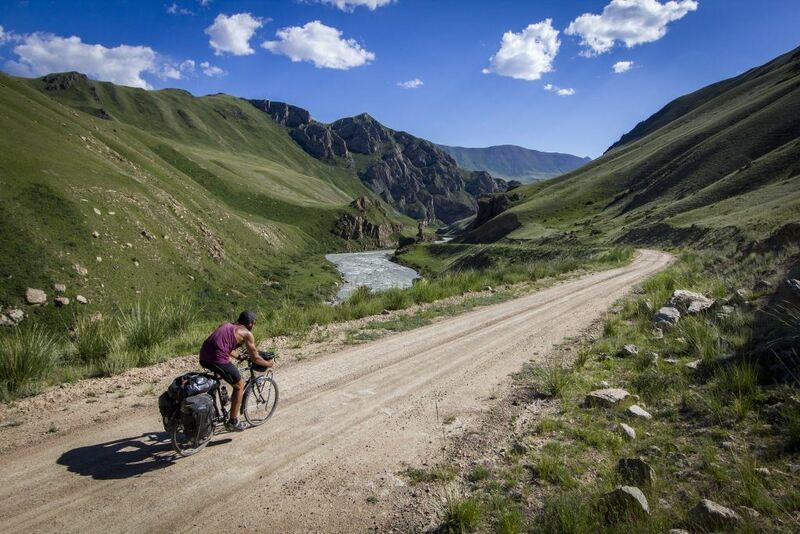 In 2015, Joshua Cunningham spent 11 months cycling 21,000km through twenty six countries from Dumfries, to Hong Kong. 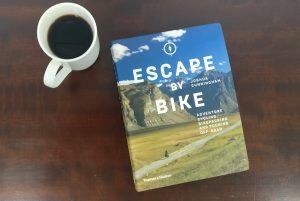 ‘Escape By Bike’ is not simply a journal of Joshua’s adventure, but a guide for anyone who plans or simply dreams of experiencing the world by bike. 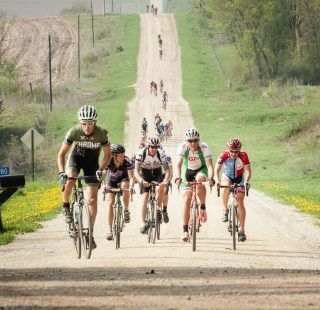 Memoirs of extreme cycling endurance are often a self gratuitous ego trip. An opportunity to boast of ones triumphs. Not so Cunningham whose down to earth style is refreshing and easy to read. Like many of us, Joshua’s love of cycling started at an early age. As a teenager, he and his friends would spend their summers exploring areas of Europe, honing their skills as cycle tourers. These experiences fed the appetite for increasingly ambitious adventures leading eventually to the journey documented in this book. This lavish paperback is broken down into five chapters that concentrate the different environments experienced during the journey from Dumfries to Hong Kong (forests, mountains, desserts, tropics and cities). It sounds like oversimplification, but the story transitions seamlessly as Joshua and his friends cross Eurasia, sharing their experiences in the varying climates and the challenges each presents. If the Alps was a sea of great whites, then the Balkan ranges had been an ocean of piranhas, nibbling away at my strength with their sharp inclines. 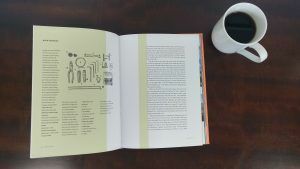 Scattered throughout the book are snippets of practical advice to help any aspiring bikepacker plan their own adventure by following Joshua’s own wealth of invaluable experience on bike choice, budgeting and insuring your travels, equipment lists, the challenges of obtaining visas and survival in extreme conditions. 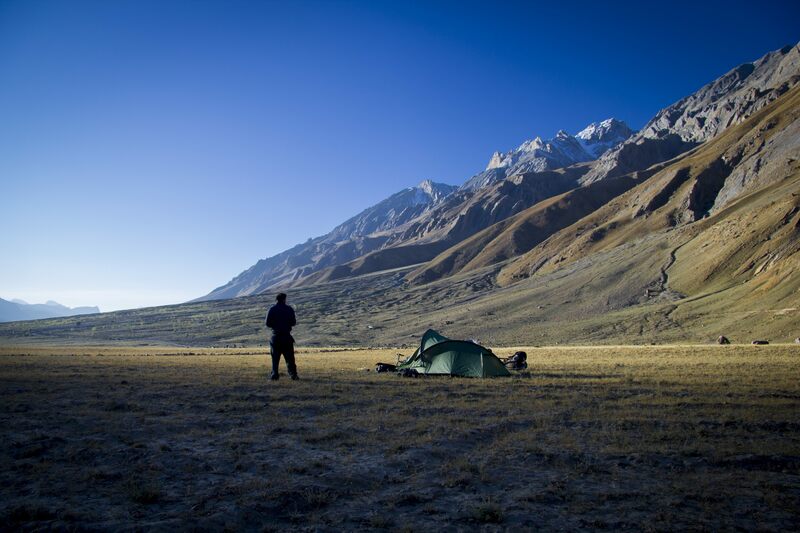 Not only is the account of the journey a captivating read, you’ll return to look over the photos again and again. 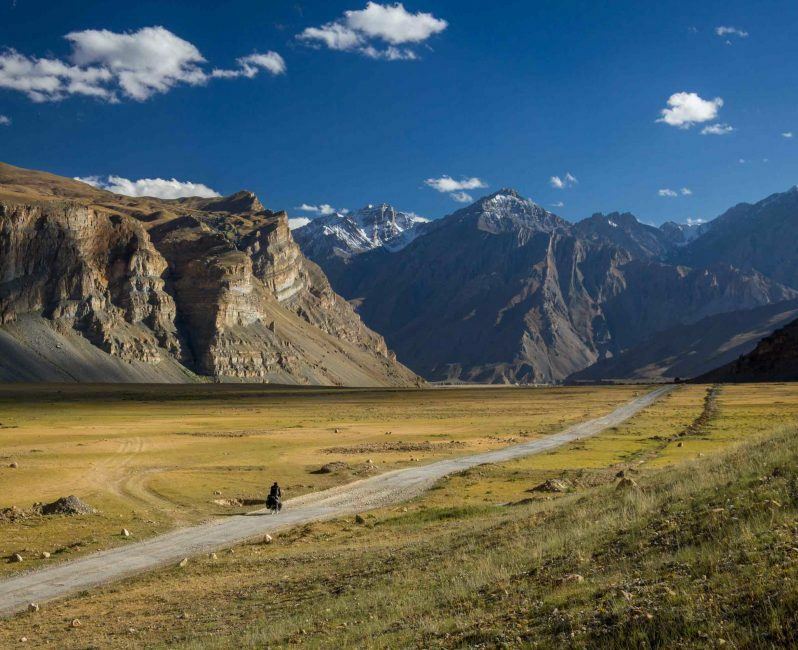 The views of the Himalayas casting shadows over the insignificantly small cyclist, make you realise how immense our world really is. 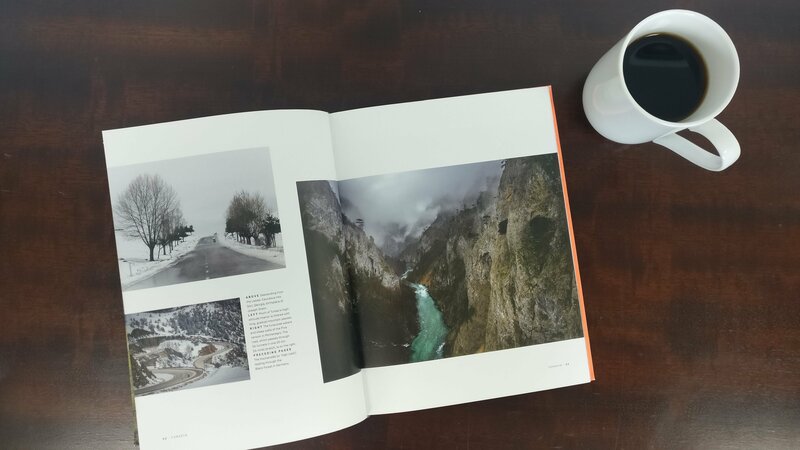 These inspirational images alone make Escape By Bike a true coffee table book. If you’ve spent any time flicking through bikepacking media then you may spot a familiar style to the illustrations throughout Escape By Bike, which are from Chris McNally, whose characteristic style lends itself perfectly to Joshua’s advice and planning sections of the book. Cunningham’s enthusiasm for touring by bicycle is contagious and if by the end of Escape By Bike you feel you’ve caught the bug too, you’ll gladly see his advice even extends to documenting your own cycling journeys. 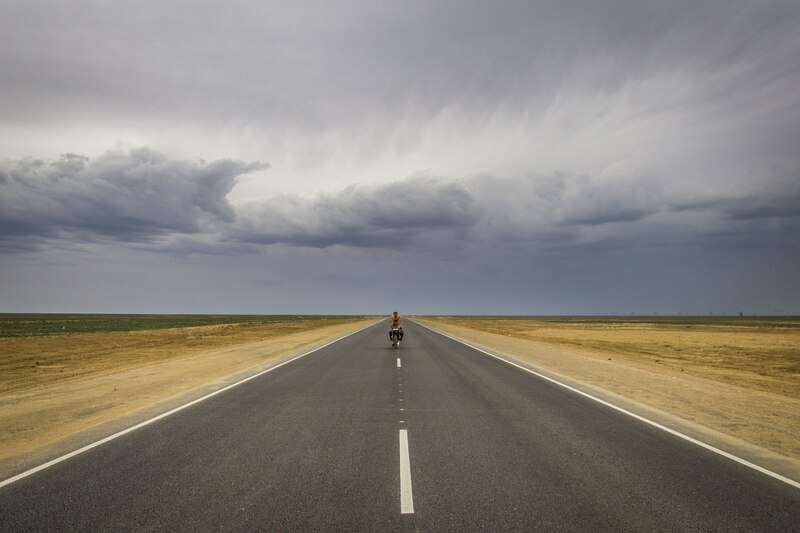 Even if you never intend to bike pack and have no desire to sleep under a tarp, you’ll struggle not to be captivated by Joshua’s recollection of his eleven months on the road. Escape By Bike is published by Thames & Hudson and available from all good bookshops now. You can find out more about Joshua Cunningham via his website, twitter and Instagram feeds.